The "live-capture" version of the Piute Trap, pictured above, is the first trap I ever set after my Tracker School Standard class. It was set up to trap a squirrel that came in the house basement through the chimmney and was hopelessly trapped inside the house. It actually worked! No surprise though, I baited it with pizza. (Squirrels are suckers for pizza and peanut butter). Chalk one up for primitive survival skills! This mechanical trap is a faster (more sensetive) version of the Figure-4 Trap. The piute trap has a multi-directional trigger in that in order to trigger the trap the quarry can move the trigger-stick up, down, left, or right. Unlike the Figure-4 it uses up to 10" of cordage. However, it uses light cordage (some threads unraveled from clothing and twisted together will usually work quite well) so no great effort is needed to obtain the lashing needed to make this trap effective. A rock or other weight rests on the end of the diagonal stick. This supplies downward pressure to the end of that stick. The diagonal stick rests on and pivots on the vertical stick at "C". This keeps the diagonal stick from slipping away to the left. The diagonal stick is also held in place by having the end tie to a notch at "B" with some cordage. The pressure of the diagonal stick is pulling the cordage towards the left. Cordage is tied to the diagonal stick at “B” and a small splint or dowel placed around and perpendicular to the vertical stick at "A". "A" is where the actual trigger mechanism is located. This is where your cordage is tied to the small splint. The bait is placed on the trigger-stick to the right of "A" directly under the dead-fall. This stick is generally thinner than the other two, and can be made longer as necessary. It rests either against the back fo the dead-fall at or into the ground at “E”), so that it is located directly under the weight. When the animal takes the bait on the trigger- stick, the trigger at "A" is released. The trigger-stick falls to the ground, and the diagonal stick flips up and out in a counter-clockwise arc. This allows the weight to come crashing down on your quarry, killing it. Note that the vertical stick should be resting on a hard surface, such as a flat stone. 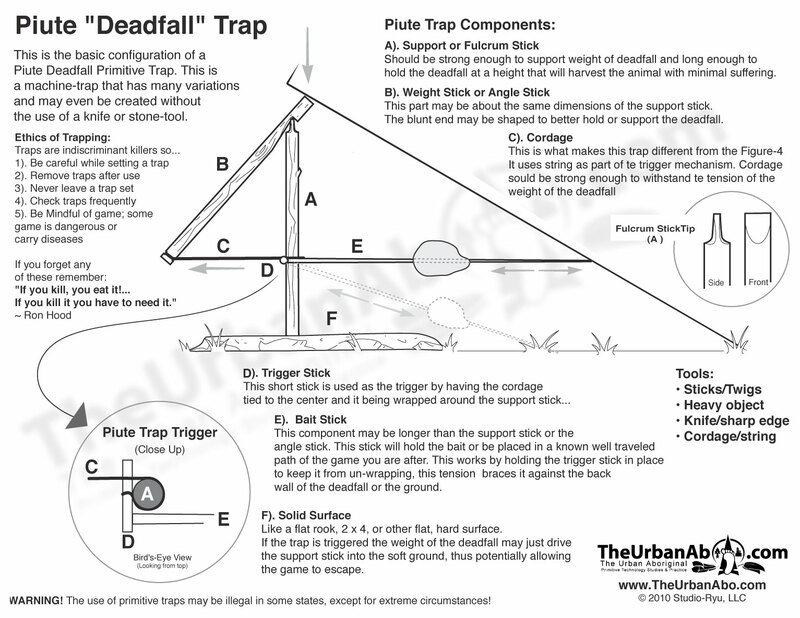 Otherwise it may dig into the ground and cannot fall out of the way when the trap is triggered - the deadfall weight will come to rest on the vertical stick and won't fall to the ground. Note also that it is usually good practice to put something hard on the ground under the whole trap, or place the trap on rock. Otherwise, the deadfall, when it falls, may not kill the animal, only injure it, since the animal may be pressed into the soft ground. NOTE: In a serious survival situation setting traps for anything smaller than a chipmunk may not be worth the caloric effort of setting up the trap. WARNING: Most primitive traps are illegal to use in most states. Unless under a life-or-death survival situation it is not recommended that you use them.